The Bloor-Yorkville BIA was created specifically to develop and implement streetscape beautification and promotional programs with a view to increasing business revenues and tourism in the area. These programs are financed through a levy, which is applied to all businesses located within the geographical boundaries of the BIA. The administration of these programs and projects are the responsibility of the Board of Management. The Mandate of the Bloor-Yorkville BIA is to improve, beautify and maintain municipally owned lands, buildings, and structures in the area beyond such improvement beautification and maintenance as is provided at the expense of the Corporation of the City of Toronto at large; and to promote the Bloor-Yorkville Business Improvement Area as a business and shopping area. 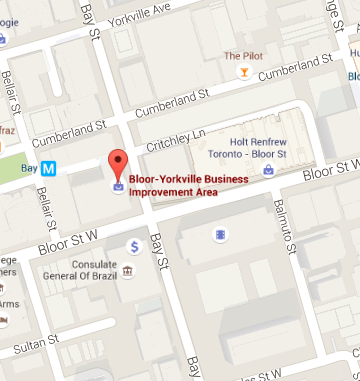 The Bloor-Yorkville Business Improvement Area has a membership of nearly 1,400 businesses. Any commercial building within our boundaries is automatically a BIA member, as a special levy is applied to the tax base. Every commercial/retail business, which pays rent in these buildings, is automatically a member too. Bloor-Yorkville is Toronto’s premiere shopping, dining and tourist district, and has been compared to New York’s Fifth Avenue and Chicago’s North Michigan Avenue. The area is home to high-fashion retailers like Chanel, Tiffany & Co., Holt Renfrew and Gucci, not to mention the countless uniquely Canadian boutiques which shoppers find in-between these fashion giants. Bloor-Yorkville’s numerous cafes, rooftop terraces and elegant restaurants provide hungry shoppers with anything from a quick bite to gourmet take-out or traditional pub fare to decadent haute cuisine. If visitors want to spot celebrities, while they’re in town; Bloor-Yorkville dining establishments are where to do it. Along with shopping and dining, Bloor-Yorkville offers a variety of special events for all to enjoy. The annual Icefest event held every February sees the neighbourhood decorated with ice sculptures, attracting people from all over the City and beyond. In the warmer months, the streets are alive with music, as Bloor-Yorkville enjoys the Summer Music in the Park program. In the Fall, we focus on the health and beauty industry, with our Beautylicious event. With museums and galleries at your footstep, Bloor-Yorkville is rich with culture and entertainment, and there is never a dull moment. Bloor-Yorkville is the world in 27 blocks. Avenue Road to the west and Church Street to the east, are borders of Bloor-Yorkville. Charles Street, below Bloor Street, marks the south boundary, while Scollard Street is the boundary to the north, with the exception of the north east corner of Yonge and Davenport.